In May 12, 2008, the Wenchuan County earthquake caused devastating loss of human life and property. Applying all the remote sensing technology available, the Chinese Academy of Sciences immediately launched into action, making full use of its state-of-the-art facilities, remote sensing planes, and satellites to amass invaluable optical and radar data. This unprecedented use of comprehensive remote sensing techniques provided accurate, up to the minute information for disaster management and has left us with a visually stunning and beautiful record that is as much a scientific achievement as it is an artistic one. 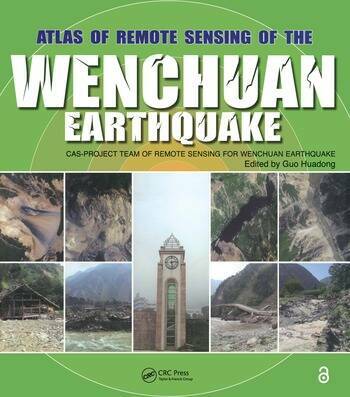 Based on the accumulated data and images collected by the Project Team of Remote Sensing Monitoring and Assessment of the Wenchuan Earthquake, Atlas of Remote Sensing of the Wenchuan Earthquake documents the events as they happened in real time. The book covers the disaster from six aspects: geological, barrier lakes, collapsed buildings, damaged roads, destroyed farmland and forests, and demolished infrastructure. It also demonstrates that the Dujiangyan Irrigation Project, which has been standing for 2000 years, remains fully functioning, and keeps the Chengdu Plain operating optimally even after the earthquake. Translated into English for the first time, the Atlas presents a pictorial summation of this unique project. It chronicles the event with over 280 before and after color images from a range of perspectives. This volume dramatically demonstrates the value of remote sensing for understanding how an earthquake unfolds and the potential of remote sensing in helping coordinate emergency relief. A pictorial record of events as they unfolded, this book provides a systematic documentation of earthquake damage that can be used to prepare for future seismic events. Prof. Guo Huadong is the Director General and Professor at the Center for Earth Observation and Digital Earth, Chinese Academy of Sciences(CAS), He has been engaged in remote sensing research since 1977, devoting to research on radar remote sensing, development of new earth observing systems, and remote sensing applications. He was project leader of more than 10 key programs related to earth observation. For the past over 10 years and at present, he was and is one of the principal investigators for SIR-C/X-SAR, JERS-1 SAR, ERS-1/2 SAR, Radarsat-1/2, Envisat, SRTM, and ALOS programs. He is a member of International SAR Working Group, Chairman of the Associate on Environment Remote Sensing of China, Secretary General of International Society for Digital Earth, Editor-in-Chief of International Journal of Digital Earth, member of Codata executive committee, and guest professor of 7 Universities in China. He was the Principal Scientist of Expert Group for Information Acquisition and Processing Technology, National High-tech Research and Development Program in China from 1996 to 2000. He has published more than 200 papers and 15 books. He is the recipient of 3 national awards on science and technology, and 9 awards by the Chinese Academy of Sciences.